Hilary and I recently holidayed at one of our Island Shacks at Spring Beach on Tasmania’s east coast. We drove south a few kilometres to lovely, deserted Rheban Beach and cycled 2.5km along it at low tide. The beach is a mid-bay spit which grew by northeasterly accretion of sandy beach ridges during the last five thousand years or so (ie in the Holocene Epoch; extending from about 12,000 years ago to the Present). At its northwestern corner, near where the long-gone Rheban jetty once projected out into Mercury Passage, we noticed ship’s timbers sticking out of the sand. It’s almost certain these timbers are all that is left of the Annie Taylor, a 27m long ketch built in Melbourne in 1920, and wrecked at Rheban in November 1923. Almost a hundred years ago, Annie Taylor had loaded timber at the jetty. She was anchored offshore before leaving for Melbourne. A gale came up, she was blown ashore, and broke up slowly. Over the decades since, wave action and sand movement seem to have shifted her skeleton about. Read more about her and hundreds of other Tasmanian shipwrecks in the beautifully-composed Tasmanian Shipwrecks (Volumes 1 and 2; 2013) by Graeme Broxam and Michael Nash. If you are travelling on Tasmania’s east coast, visit the township of Triabunna, and on the waterfront call in at the Spring Bay Maritime & Discovery Centre which has an Annie Taylor display. Annie Taylor at Hobart. She was almost new when she was wrecked in 1923. Photo reproduced from: Broxam, G. and Nash, M. (2000). Tasmanian Shipwrecks. Volume Two 1900 – 1999, page 123. Roebuck Series Publication No. 54. Navarine Publishing. Annie Taylor on Rheban Beach – not long after beaching judging by the flotsam around her. Photo reproduced from: O’May, H. (1954; reprinted 1985). Wrecks in Tasmanian Waters 1797 – 1950.Tasmanian Government Printer . Annie Taylor on Rheban Beach, probably late 1923 or early 1924. Annie Taylor on Rheban Beach in 1954. Photo reproduced from: Broxam, G. and Nash, M. (2000). 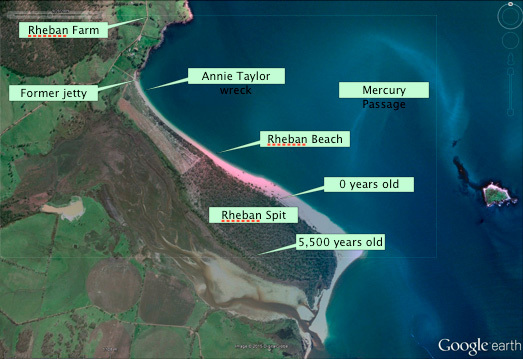 Tasmanian Shipwrecks. Volume Two 1900 – 1999, page 123. Roebuck Series Publication No. 54. Navarine Publishing. Annie Taylor at low tide on Rheban Beach, February 2015.